Tried everything? AllerFADE® is guaranteed to stop dogs from licking and chewing their feet, causing you anguish and hard-to-heal, painful sores in your pets ears. 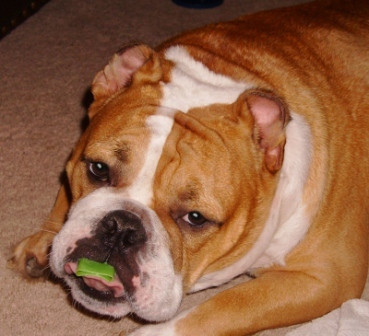 Gregg Miller created AllerFADE® specifically to stop his own English Bulldog from licking and chewing his feet, and from constantly scratching his ears. The new product by CTI Corp is available NOW. Dog owners ask "Why won't my dog stop chewing on his feet?" or "My dog's ears are red and irritated but I can't keep giving him anti-itch medicine forever!" Benadryl and other immune-depressing medication may work but they don't CURE the problem. Our staff was intrigued when Mr. Miller said "I created this product because once again, I was having a problem with Humphrey my Bulldog... He licked his toes endlessly. 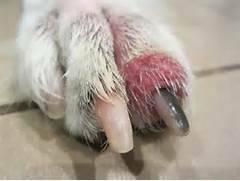 He had a chronic infection, red inflammation, even blisters between his toes and on his ears. Humphrey was in pain and limped when he walked." We asked Mr. Miller to tell us more and he said "It really works, Humphrey said thank you!" 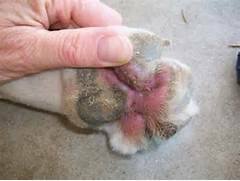 He went on to explain that AllerFADE is a special formulation created to stop and prevent allergy-related sores that commonly occur on and between the toes and also on the ears of pets prone to allergies. AllerFADE is an FDA approved antibacterial antiseptic and antimicrobial skin cleanser that alleviates the itch and helps heal the sores. He said "What makes it so effective is that AllerFADE provides INSTANT pain relief from allergy related itching and painful toe sores and ear redness." (just dilute 1 tablespoon in 8 oz, water as a dip for feet or soak in cloth and wipe for healing ear irritation). The best part is that the first application not only instantly relieves the pain and irritation, but it also begins to dry up and eliminate those sores, blisters, swollen pads and ears. AllerFADE leaves a protective barrier that kills bacteria on contact and keeps killing any forming bacteria for up to 48 hours after each application. Perfectly safe and 100% effective which can prevents further attacks. Mr. Miller said "After taking Humphrey to three veterinarians who specialize in pet allergies, and spending hundred of dollars trying to get relief for my boy's feet and ears, I was told, "I'm sorry Gregg, there's nothing more we can do." No dog owner wants to hear those words! He said that was when he decided to turn to science and discover a cure. We were intrigued because we've heard from readers about his other products. He provided these photos and information from his company site, proving the results of AllerFADE are amazing! We decided to just let him take over from here! "I consider this another break-through because so many other pets SUFFER from this disorder AND THERE IS NO CURE OR EVEN HOPE FOR RELIEF from it UNTIL NOW. "Veterinarians KNOW FULL WELL they can't provide a cure or relief from these allergy attacks - but charge hundreds of dollars providing medicines that don't work and create false hope. Now dog owners can ELIMINATE the problem without harmful, often ineffective drugs or fake products that only provide failed results and continued pain for your pet.
" TheDogPlace.org is the first website I have provided with this new information, other than my own facebook posts. I want to release news of this new product and I know you will get it to the most people now that it is AVAILABLE! "AllerFADE is NOT A CURE but when used every other week or so, it WILL HEAL AND PREVENT FUTURE ATTACKS. It is the only product in the world that works. "Today my Humphrey runs and plays pain free. His non-stop licking has STOPPED and he's a happy Bulldog again. "When the vet say's "We're sorry there's nothing else we can do" it's AllerFADE TO THE RESCUE! To order online go to http://neuticles.com/allerfade.php or email questions to: neuticles@aol.com, attention Gregg Miller. "When my company came up with iStainGon, many said it wouldn't work but gosh darn it, we proved them wrong! Many of your subscribers tried iStainGon and NOT A SINGLE COMPLAINT, in fact re-orders have been phenomenal!" 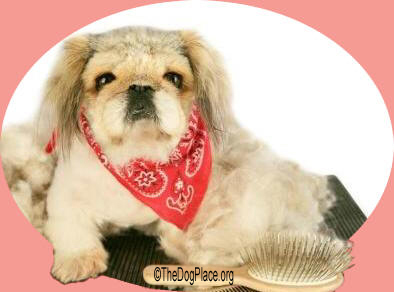 TheDogPlace.org is proud to be able to inform our readers about these unique products. Mr. Miller's creativity and desire to help dogs makes him a real "dog person" although he doesn't breed or show dogs. Mr. Miller's Kansas City, MO based company is not new to the veterinary and pet community. CTI Corporation celebrated its' 20th anniversary and is also the creator of other advanced products including TempoStay Ear Supports, CT Eye Implants and ScarGon gel. Visit http://neuticles.com/allerfade.php for more information and other online ordering options for all of CTI's products.